CNAs working in the state of Colorado, received lucrative salaries ranging from $27,929 to $31,671 on an annual basis (as of December 2014, according to salary.com). The U.S. Bureau of Labor Statistics revealed that the mean annual and hourly pay received by the certified nursing assistants in May 2013, was $28,120 and $13.52, respectively. Approximately 17,200 certified nurses were reported to work in CO in May 2013, and the employment per 1000 jobs was 7.49. As per indeed.com, the average CNA salary in Colorado (as of December 2014) was $22,000, which was projected to be 11% lower as compared to the average CNA salaries for job postings at the national level. 90% of CNAs made less than $36,440; 10% made more than $36,440. 75% of certified nurse assistants earned less than $31,310; the remaining 25% earned more than $31,310. 50% were salaried less than $27,560; the rest of 50% were salaried more than $27,560. 25% of CNAs were paid annual wages less than $24,020; 75% were paid more than $24,020. 10% of employees were offered less than $21,060; 90% were offered more than $21,060. An important factor that affects the calculation of nurse aides’ salary in the state is their geographical location. 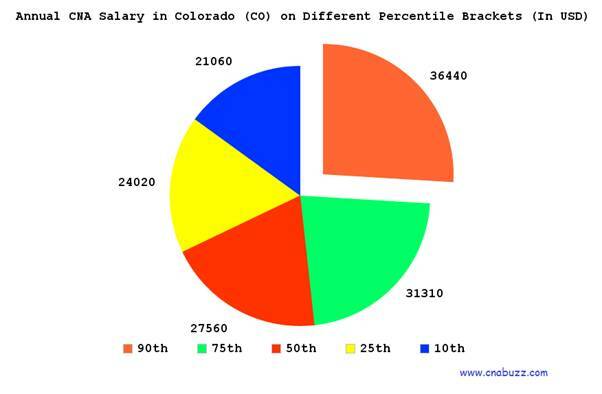 Each city in CO has different pay, which depends on the availability of employees and salary reforms. From the data provided in the following table, it can be concluded that the highest paying city of CO was Boulder with median yearly salary of $31,671, and median monthly salary of $2,639. The median hourly wages were between $13 and $15. With median annual salary of $27,929, the lowest paying city was Jefferson. In the nursing sector, each and every job title has its own set of duties, salary, responsibilities, and benefits. A better job position will certainly offer a better salary package. In December 2014, CNA Hospice earned $28,000. On the other hand, CNA Rrmc and Medical Assistant Family Practice made $26,000. Nursing assistants with other designations enjoyed the pay between $13,000 and $24,000 per annum. Although, the cost of living is comparatively low as compared to other states, nursing aides still have a bright future in Colorado. Due to new health reforms and speedily increasing population of elderly people, the requirement for nursing assistants is escalating at a constant rate. The employment opportunities for CNAs are expected to augment by 21% from the year 2012 to 2022. This growth rate is much faster as compared to the other professions in the country. So, if you are looking for a bright future in this field, enroll for CNA Program soon. Question 1 – Which is the best paid nursing assistant jobs in the state of Colorado? Answer – CNA Hospice was one of the highest paying job titles in CO with the annual income of $28K (as per indeed.com, as of December 2014). Question 2 – I am a high school student and want to pursue my career as a nursing assistant. How much salary can I expect in this profession, in the state of CO? Answer – One can expect an average annual pay of $22K (as per the reports of indeed.com, as of December 2014).